GU and Hydrapak have teamed up to design a customized soft-flask with a high-flow nozzle to make fueling for long efforts more convenient and less sticky. The Flask holds 5-Servings of Energy Gel and includes marks on the back to measure your fuel. This flask is fantastic. It becomes very instinctive to use on the go & can be operated completely one-handed. Just bite, twist, squirt enough gel for your needs, twist again to close. 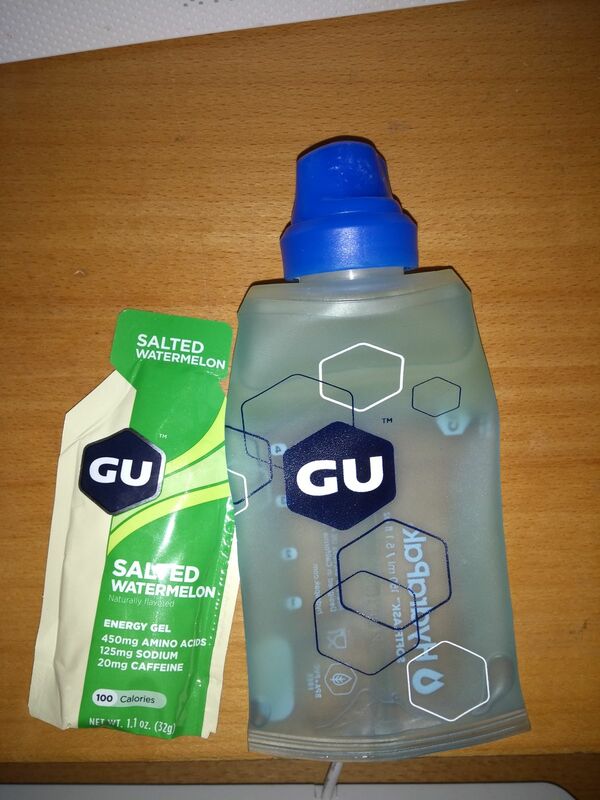 It is measured for 5 GU gels capacity but I managed to easily fit 7. It is small & fits in any ultra vest unobtrusively. When racing I want as little clutter in my vest pockets as possible for nutrition management & quick aid station transitions, this flask really helps that. It also helps that I don't now have to worry about a potential littering disqualification because of accidentally dropping used gel wrappers since all of them will be in a single container.